The Bangalore Metro system is also known as Namma Metro. The Metro has become one of the most favored public transportation modes for daily commuters of Bangalore. Civil construction of Namma Metro had started on 15th April 2007. Its sixth and final section was inaugurated on 17th June 2017 by the President of India. Presently, the Metro is second only to Delhi Metro in length of the operational network. The 42.3 kilometers long Namma Metro serves 41 stations across Bangalore. It has color coded lines and three types of stations, underground, elevated and at-grade. 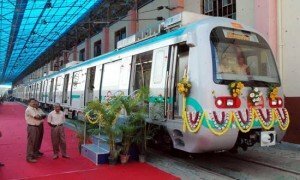 The government of Karnataka in cooperation with Government of India has formed the Bangalore Metro Rail Corporation Ltd or BMRCL to operate and regulate the Namma Metro. Read more here.